To me, fall means it is time to make Joan Nathan’s delicious plum pie. It’s a tart to most of us, and I have added almonds to the topping, as you see here. I often make a double batch of the crust and freeze an extra for another day. I make do with whatever kind of jam I have on hand, just as the recipe suggests. But I only make it with the specified Italian prune plums. They are smaller and more oval than the plums most often found in markets, and they “melt” into the filling in a much better way. 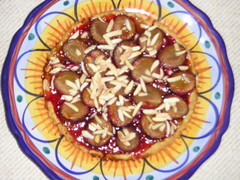 When I made the tart with regular plums once, they just didn’t work well. I see prune plums in ShopRite most often, but sometimes in other markets. For some reason, even though their season supposedly runs all summer, I don’t find them until late summer/early fall.